Brooklyn’s most famous Boxing gym, Gleason’s Gym hosted Top Ranks meet and greet event on Wednesday December 5th. Here the fighters from the Lomachenko vs. Pedraza card met with the kids from Gleason’s “Give a Kid a Dream”, a nonprofit corporation in where they provide mentorship to disadvantaged youths through the sport of boxing. Jose “Sniper” Pedraza who will be fighting in the main event Saturday, was among those fighters at the meet and greet. In the midst of it all, Boxing Insider had the opportunity to catch up with Jose on his upcoming bout. Boxing Insider – Jose how do you feel for your fight against Lomachenko this Saturday? Jose Pedraza – I feel great. I’m excited for it to be the 8th of December already so I can put on a great show for you all. Boxing Insider – How do you feel to be fighting here in Madison Square Garden? Where fighters like Miguel Cotto have created a grand legacy. Jose Pedraza – I feel very excited to be fighting here where not only Cotto has fought, but many other Puerto Ricans have fought. Like Tito Trinidad who is one of the biggest names in Puerto Rican Boxing. I feel very excited to be part of that history. Boxing Insider – Without giving too much of your game plan away, I’m curious on knowing on how you are going to approach and counter Loma’s movement come Saturday? Jose Pedraza – well I’m definitely the taller fighter in this fight, so I am going to have to use my distance to my advantage. We need to have great conditioning, which we do, to be able to fight at his pace and to make good usage of my speed. Boxing insider – Going into this fight, what do you think would be Lomachenko’s most difficult attribute to adjust to? Jose Pedraza – well we are going to see how the fight unfolds. My team and I have studied Lomachenko really well. So, we are going to see how the fight unfolds and make the proper adjustments as the rounds go by. Boxing Insider – This is a big fight for you to end the year with. God willing, you come out victorious this Saturday, who else out there would you like to face? 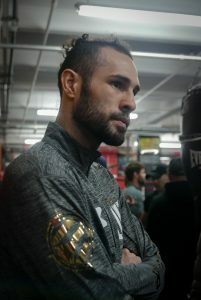 Jose Pedraza – well after this fight, which I’m a 100% sure I will be victorious, we’re going to go after all those great champions in the division. We’re going to continue unifying the belts. So, we are going to make sure we keep training hard so we’ll be ready to take on these fights. Boxing Insider – Thank you Jose. All the best for this Saturday! Jose “Snipper” Pedraza (25-1 12 KO’s) is currently the W.B.O World Lightweight Champion. He is only the second Puerto Rican boxer to win world titles at 103 and 135 pounds. Jose will be taking on 2-time Olympic gold medalist and currently the W.B.A Super World Lightweight Champion Vasiliy “Hi-Tech” Lomachenko (11-1 9 KO’s) in a unification bout Saturday December 8th at the Hulu Theater at Madison Square Garden. The fight will also be live on ESPN at 9 p.m ET. Tune in for another exciting night of Boxing!